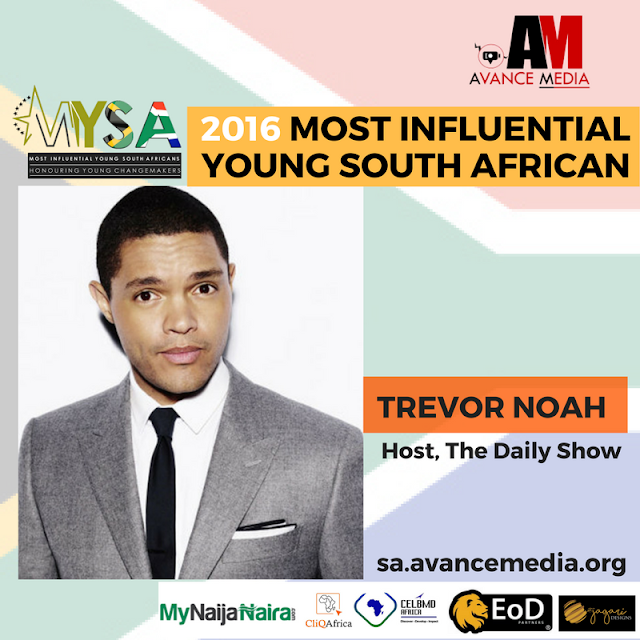 Trevor Noah, the South African host of The Daily Show, has been voted the 2016 Most Influential Young South African in a public ranking poll by reputable rating establishment, Avance Media. 2016 saw Comedian Trevor Noah, making The Daily Show become a global phenomenon, and was among the top commentators for the 2016 US Presidential Elections which also had him interview US Ex-Presidents Barack Obama and Bill Clinton. 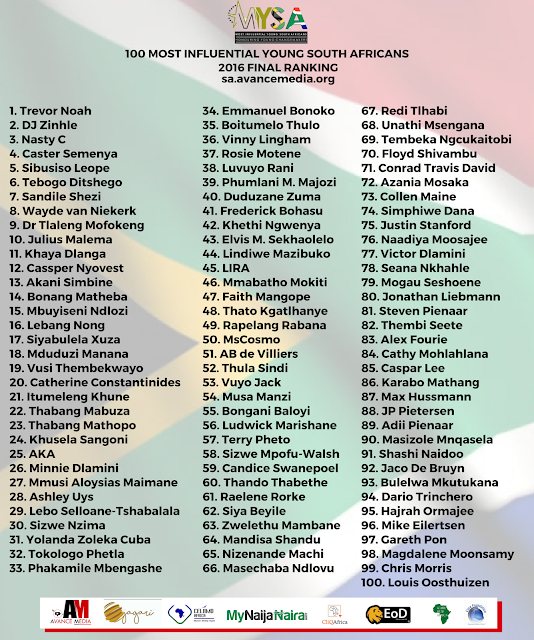 Votes which drew public participation from about 90 countries from across the globe also endorsed DJ Zinhle, Nasty C, Caster Semenya and Sibusiso Leope as among the top 5 young South Africans who influenced South Africa and beyond in 2016. DJ Zinhle known in private life as Zinhle Jiyane, and one of the few women in South Africa who took up a career in Disc Jockeying also got voted as the Most Influential Young Lady in the ranking. · Business: Tebogo Ditshego – CEO, Ditshego Media. 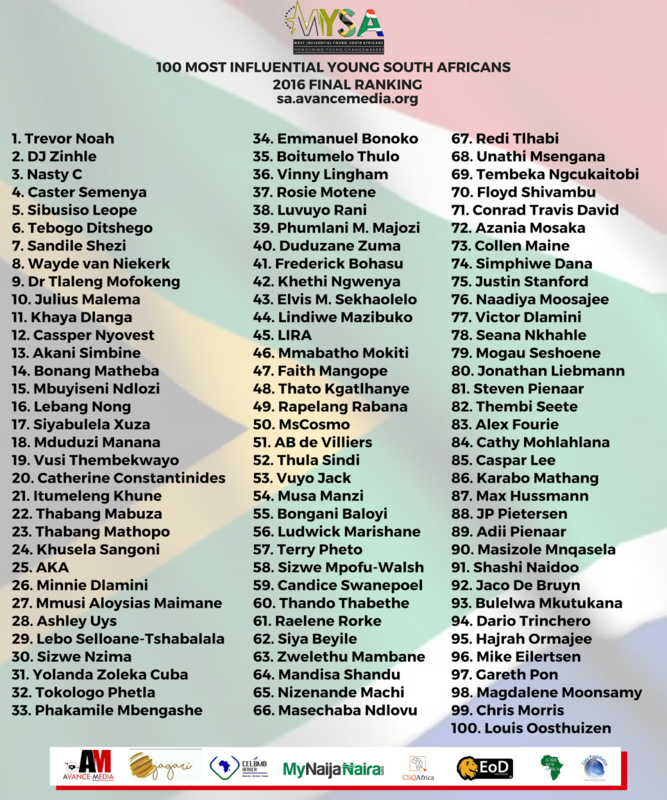 MD of Avance Media, Prince Akpah extended his appreciation to all who participated in the inaugural ranking polls for South Africa and advised young people to learn and be inspired by the stories of these young achievers as they represent South Africa on the globally. The 100 Most Influential Young South Africans is an initiative of Avance Media in partnership with Reputation Poll, EOD Partners, Jagari Designs, CELBMD Africa, My Naija Naira, Dream Ambassadors Foundation GH, iCare Hub Africa, Global Skills Exchange, Core Foundation Barcity Media and Project Know Thyself International.